From dropped tuning Rock & Metal to Archtops & jazz – we believe there is no such thing as a standard set-up! Years of working with players & listening to their requirements helped us develop a better understanding of the finer-details when setting up an instrument. We refuse to offer basic ‘tweak it’ set-ups & believe our guitar set-up procedure to be one of the most valued services we offer. A professional set up will improve the playability of your guitar, whether it’s a vintage Les Paul or a brand new Strat. 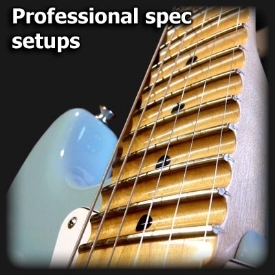 Every Guitarlodge set-up is carried out to very high exacting standards using the latest specialist tools, measuring devices & covered by our guarantee, (see terms & conditions at bottom of page). Once you decide on a Guitarlodge set-up, we will discuss all the important aspects of the work schedule in fine detail to ensure we get it right for you. Factors like string brand & gauge, playing style, tuning, action preferences & any issues you may be having with the instrument, are all taken into consideration before we even look at your guitar. The advantage of having worked on pretty much all of the main brands, is that we can normally go straight to the commonly found adjustment related problems & solve them during the early stages of the set-up, saving you the expense later! Please read the sections on this page including terms & conditions, if you are considering one of our pro set-ups. See our prices page for guidance on costs. Please contact us If you are considering a professional set-up. If via email please include your instrument make & model along with a detailed description of any issues that might need attending too, like string buzz or notes choking at certain frets etc. Better still, pop into our repair centre where we can discuss your personal set-up preferences. If extra work is necessary on your instrument we will do our best to give a no-obligation quote. Personal preference: Guitarists have varied tastes & demands when it comes to the feel of their instrument, most reputable retailers assume serious players will have their treasured new guitar professionally set-up to their personal preferences shortly after purchase. We carry out professional instrument adjustments for a wide variety of players & styles, some are with touring bands & others are just starting out. From classic rock to metal, folk to country music, our set-ups cater for everyone! New guitars are no exception: A large percentage of guitars purchased on-line or from music stores will have the standard manufacturers factory setting. Unfortunately these settings can vary & are extremely susceptible to the effects of long distance transportation, humidity, bad handling & storage etc. Those combined factors can have a detrimental effect on string action & very often render the instrument unplayable! Store guitars frequently sit on hangers for months getting played by numerous potential customers before sale. 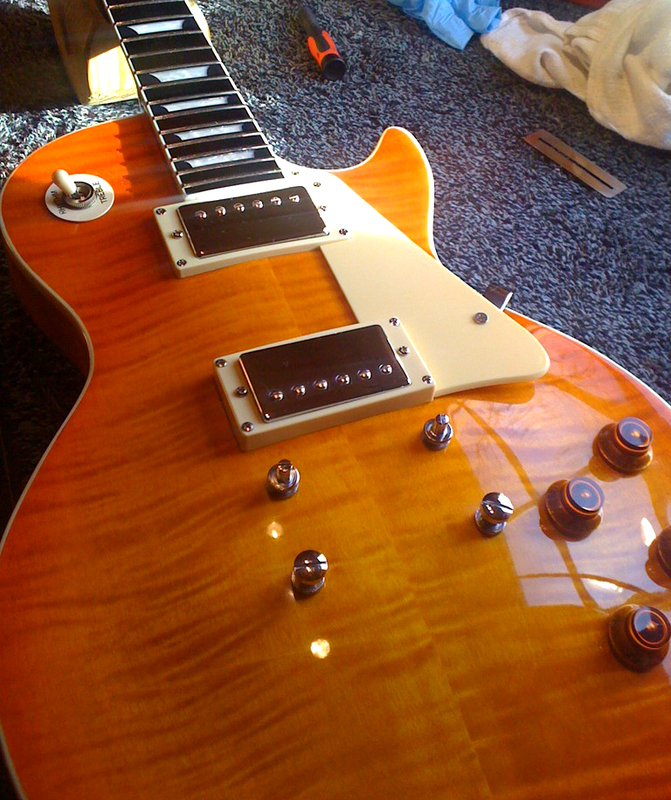 They are normally restrung soon after purchase & that’s when playability problems usually emerge. Any brand of guitar, low or high budget, can benefit from a professional set up. Many players are now realising you do not have to spend a fortune to get your hands on a great playing instrument. The checklist below which includes most of the standard settings & adjustments commonly carried out, is based on a typical guitar set-up scenario. The guide does not take into consideration any additional fretwork or replacement of worn components that may be required. Visual inspection: Includes checking for loose, worn, uneven frets across the fingerboard, worn or corroded components like grub screws in saddles, worn top-nuts, dis-functional truss rods, faulty tuners, loose braces lifting bridges & signs of humidity damage on acoustic & archtop type guitars (see structural repairs). Cleaning of all components: We thoroughly clean everything from the bridge, tuners & electrics (if required), to the body finish using specialist-cleaning products. This stage of the set-up process also includes polishing of the frets & oiling of Rosewood & Ebony fingerboards (If required). Restringing: We can supply, fit & advise on any brand, gauge & type whether you are dropping the tuning & using heavy gauges for metal styles or using flat-wounds for jazz! Please be aware that new strings will always be required on all our set-ups. Neck adjustments: One of the most influential adjustments on the set-up is the bow or relief of the neck. Too much relief results in high action, poor playability & bad intonation amongst other problems. Too little & you’ll suffer string buzz, dead spots & choking of notes when bending strings. Correct neck adjustment is essential when installing heavier string gauges or dropping the tuning on an instrument. Rock/metal set-ups in particular require exact balance between the truss rod & string tension to minimise fret rattle. Bridge adjustment: On Floyd Rose Tremolo systems & similar the float angle will also be set before or during these adjustments. Setting acoustic guitar string height at the bridge can be more involved. Skimming of the saddle can reduce high action slightly but a neck reset is sometimes necessary in extreme cases of high string action (see structural repairs page). Nut action: Obtaining the correct balance & action at the nut is a crucial step in the set-up procedure. Poorly slotted or worn top-nuts can cause open strings to buzz, tuning problems, string breakage, poor intonation & lack of sustain. Nut slot size has to be precise & installing significantly lighter strings can sometimes render a nut useless! Heavier gauges require slot widening to avoid string grabbing. Pickup adjustments: Correctly adjusted pickup heights ensure even output across all selector positions, whilst minimising distortion & magnetic string pull, although personal preferences can often dictate these settings to a degree. When making bridge adjustments on electro acoustic guitars with transducer pickups, we always check for output balance variations between strings & rectify if necessary. 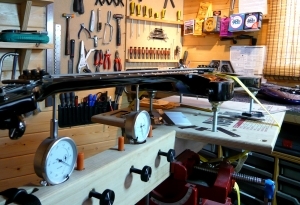 Setting the intonation: This final stage involves fine-tuning of the moveable saddles at the bridge (where possible) to ensure the instrument plays in tune, as evenly as possible, over the entire fret-board. The intonation is checked between the 12th fret & the bridge using a calibrated stroboscopic tuner. Report: All adjustments are re-checked after a day or so & the instrument is then given a final test/clean. A full report is standard with all our set-ups; this will include detailed information on every adjustment carried out & any additional repair work involved, along with cost details. Fret problems: Inevitably not every guitar set-up is straightforward. General wear & tear along with short-cuts in manufacturing standards can limit the level of accuracy & fine tolerances essential for correct adjustment. It only takes a slightly high fret to dictate the action for a whole fret-board. We always allow for the dressing of one or two frets & the odd part replacement in our set-up costs, simply because experience has shown us its often the difference between an average & great set-up! 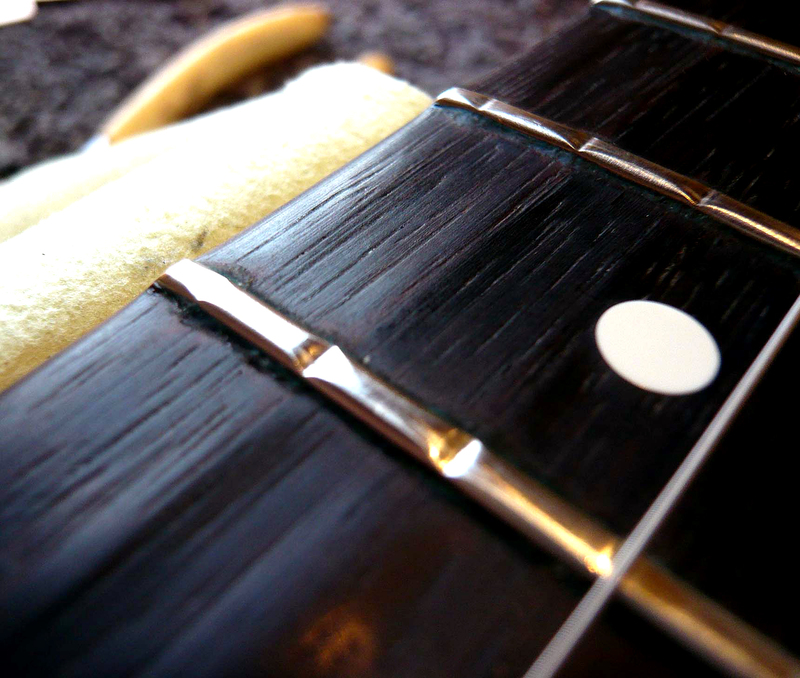 Fret dressing or possibly re-fretting of the whole fret-board may be necessary if there is evidence of substantial fret wear. We will always advise you accordingly if extra work is needed & do our best to keep your costs down! Please see our Refretting & fret dress page for more details. Our work policy: We always guarantee with no exception to make all the necessary step-by-step adjustments covered in our set up procedure list. Should we notice any other work that we feel may need attending to on your instrument, we will discuss this with you & only proceed if requested to do so. Your guarantee: All our set-ups are guaranteed against adjustment movement & failure for a period of one month from the day of collection. We are happy to make slight adjustments to your instrument within this period. This does not cover string breakages or bad playability issues due to misuse or rough handling etc. Turnover times: Allow a time-scale of at least 2 days with set-ups. This gives the instrument enough time to settle after adjustment. In the event that other work is necessary, (fret-work for example) or additional parts are required, turnover times can be longer. We will contact you if we are unable to meet an agreed turnover time.